This natural edge coffee table was inspired by natural elements, with the intention that the overall feel remain clean and modern. 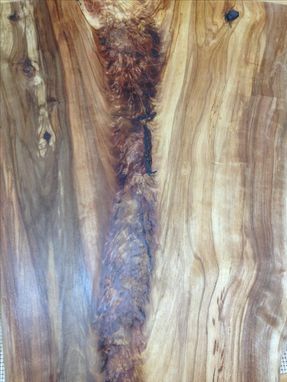 The amazing table top is a 3-1/2" thick cherry slab cut from the first major branching in the tree which results in one of a kind waterfall figure and beautiful color variation in the piece itself. 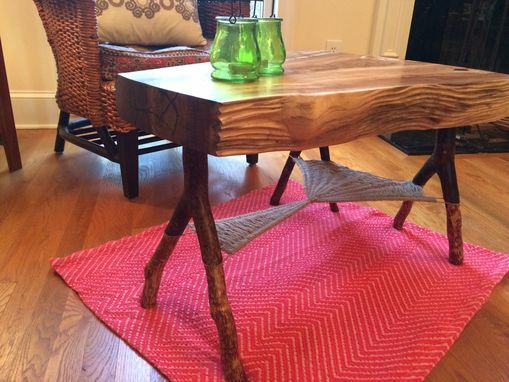 I cut and milled a dead standing cherry tree from my property here in Georgia and recently found the inspiration for the legs and woven shelf. 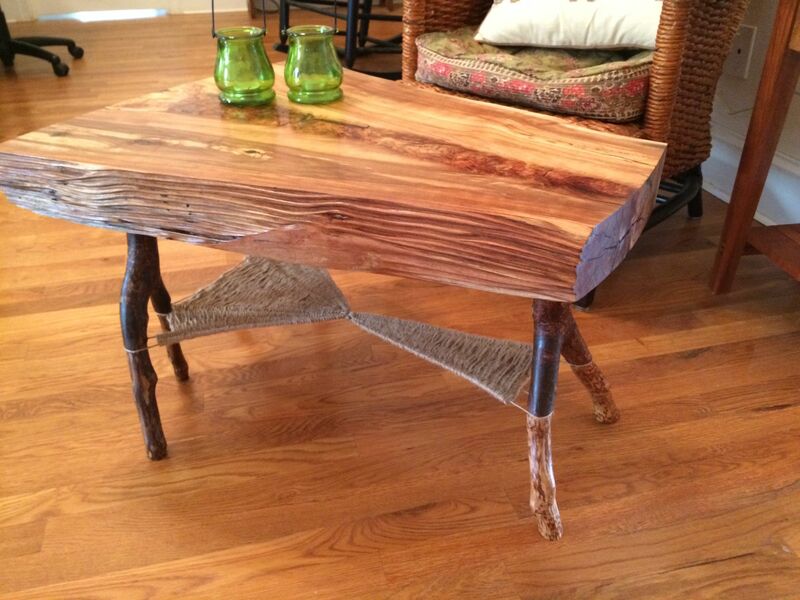 The sides of the table top are hand carved. This carving reflects the natural flowing reliefs as sand cuts away at rock for thousands of years. 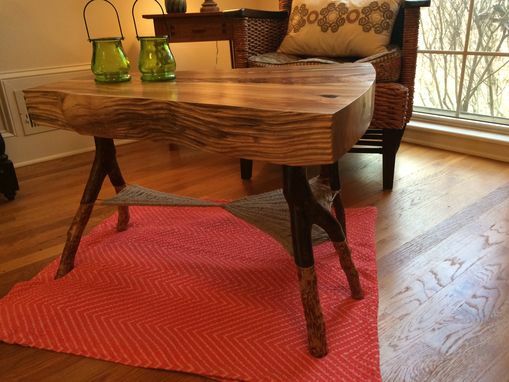 The legs are bradford pear branches that wye apart for a total of 6 points of contact the floor. 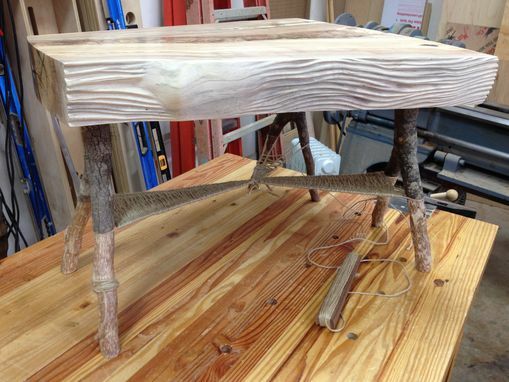 The contrasting color of the legs was achieved by using different levels of surface preparation. I left the inner bark layer on the wood for the portion of the legs above the woven shelf. 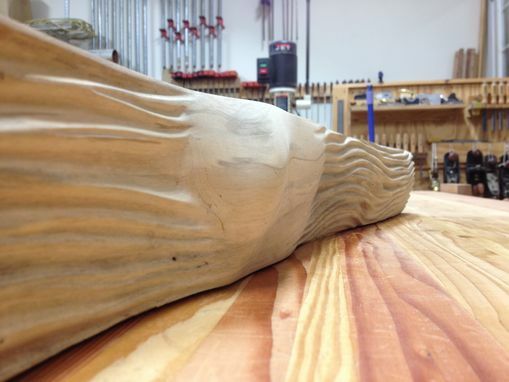 I cut the surface of the legs below the woven shelf down to raw wood. This finish is danish oil with polyurethane top coating for protection. I apply two coats of oil, letting each dry for 3 days prior to subsequent coating to ensure good adhesion of the poly top coat. The finish is fantastic. The shelf is woven from heavy duty jute cord in a spider web pattern. There is about 400' of cord in the woven shelf. Width at the widest end: 24"
Width at the narrow end: 12"
Height (floor to top of table): 18-1/4"
Height of woven shelf: 6-3/4"